Jules Evans (author of the bestselling Philosophy for Life: and other Dangerous Situations 2012) with Dr. Ben Di Mambro (Consultant Psychiatrist) and Dr. Arun Chopra (Consultant Psychiatrist). From ancient philosophy to Cognitive Behavioural Therapy (CBT), recent controversies in psychiatric diagnostics and the launch of the DSM-V, the speakers discuss how old and new approaches might interact in the provision of mental health care today. Please note that Gallery Tours are not seated events. Every effort will be made to accommodate elderly and disabled visitors. 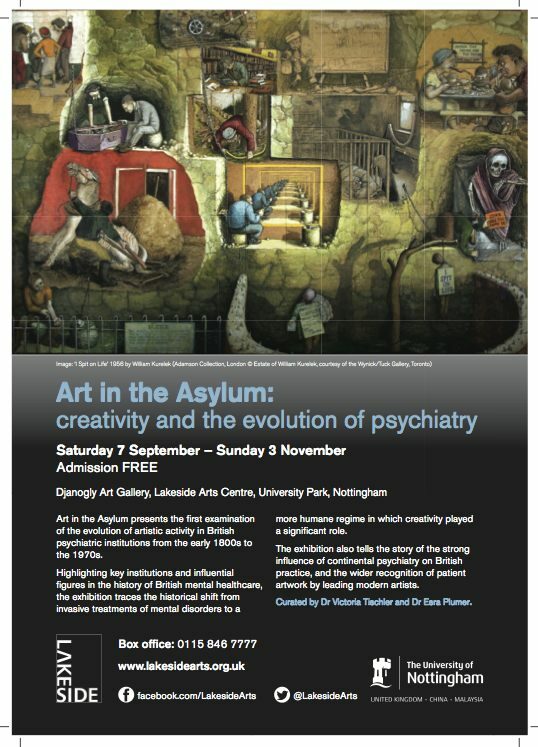 A walkabout tour led by a relay team of six post-graduates researching at the University of Nottingham in a variety of disciplines who will each bring their expertise to bear on one work in the Art in the Asylum exhibition. Each speaker will have 8 minutes before handing the baton on to the next with an opportunity for a Q&A session at the end of the evening. For all Lectures and Gallery Tours above (*unless stated otherwise) please book in advance by calling the box office on 0115 846 7777. Documentary on the radical Scottish psychiatrist R. D. Laing, author of The Divided Self 1960. Introduced by Dr. Joseph Berke, psychotherapist, who worked with Laing in the 1960s. disorder and need psychiatric help than other young men, says a UK study”. It is probable that, among gang members, high levels of anxiety disorder and psychosis were explained by post-traumatic stress disorder, the most frequent psychiatric outcome of exposure to violence”.